Star Wars: The Last Jedi unfolds in two utterly different locations: an austere, treacherous island in the most remote part of the Galaxy and the vast, infinite sky that is the setting for war. 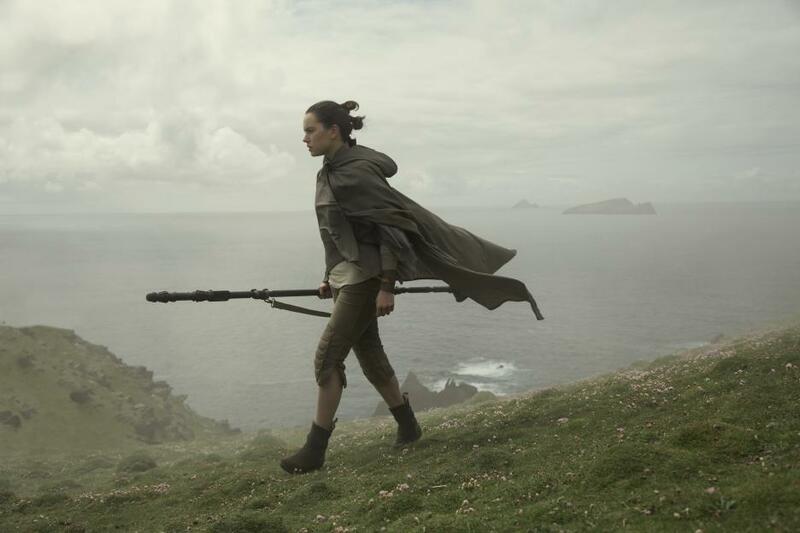 The steep, rocky island establishes a mood of danger while Rey (Daisy Ridley) tries to lure Luke Skywalker (Mark Hamill) away from his isolation (“It’s time for the Jedi to die”) and back to the life in the sky that he left. That sky is alive with the turmoil of war that roars at the audience in superb designs of modern abstractions. The sound designers have created aerial turmoil, death, and danger in nearly constant fiery explosions that blow up all manner of futuristic space vehicles and men. The ability to create this spatial chaos has grown since the first Star Wars movie in 1977 to the point where we feel nailed to our seats as the screen morphs into fiery orange violence. We marvel at what artists in 2017 can do to bring a digital story alive. The visuals are extraordinary, the acting excitingly appropriate. Luke Skywalker (Mark Hamill) and General Leia Organa (Carrie Fisher) are terrific as the alienated brother and sister who are older and wiser than the younger warriors. Laura Dern endows Vice Admiral Holdo with the great dignity that comes from calm presence. Daisy Ridley turns Rey into a young woman who injects intelligence and power into her violent trade along with an underlying sense of fair play and kindness. She is enormously appealing. Because the whole thing is imagined, writer/director Rian Johnson was free to create a marvelous mix of humans and animals who navigate the violent warfare. There are no rules in this world of the imagination and Johnson’s work is creative artistry. But there is something else going on here. In this year’s other big success, Wonder Woman, the terrific actor Gal Gadot stamped the women’s movement with approval and encouragement and gave young girls the super hero they’ve never had. Ask any teenager; they love their new role model. After that unexpected twist, women began to get stronger roles in movies just as they have begun to assert themselves powerfully in real life. Now, in this Star Wars episode, three good actors portray three strong women leaders. Daisy Ridley, Carrie Fisher, and Laura Dern have created characters whose attitudes establish the tone of the story. This is another movie that has stepped into the tide with public recognition of the strength of women. Along with the new “Me Too” movement, this is what’s happening in the real world at a fast, long overdue, and exciting clip. There is one possible cause for worry: the dark side of the explosive expansion of Star Wars style robotics. How soon will we see robotic tools of warfare and relationships erupt in our own life on earth? Perhaps next year’s Star Wars will give us some answers. Until then, they’ve given us the questions. This review was posted on December 22, 2017, in Action/Adventure, Fantasy. Bookmark the permalink.